A Presidents Day Celebration (PART 1): I Love These Guys, I Really Do. Yes, Every One Of Them. 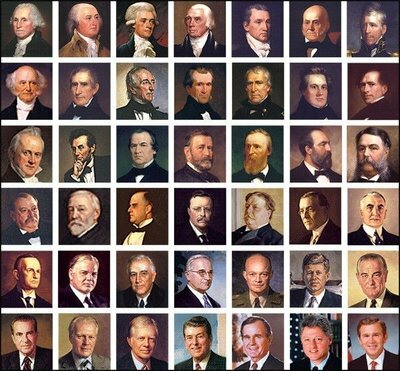 I have a lifetime love affair with the Presidents of the United States. I love these guys, every one of them. The best of them are among the most skilled and courageous leaders in world history; the least of them took more risks and sacrificed more for their country than any of us ever can or will, including me. Every one of our Presidents, whatever their blunders, flaws and bad choices, was a remarkable and an accomplished human being, and exemplified the people he led in important ways. Every one of them accepted not only the burden of leadership, but the almost unbearable burden of leading the most dynamic, ambitious, confusing, cantankerous and often unappreciative nation that has ever existed. I respect that and honor it. You know what happened. (John Hinckley almost kept the curse going, but Ronald Reagan, elected in 1980, finally broke it.) That year I became obsessed with Presidential history, devising a lecture that gave an overview of the men and their significance in order. My teacher allowed me to inflict it on my classmates. Much later, Presidential leadership and character was the topic of my honors thesis in college. When I finally got a chance to go to Disneyland, the first place I went was the Hall of Presidents. When the recorded announcer said, “Ladies and Gentlemen, the Presidents of the United States!” and the red curtain parted to show the audio-animatrons of all of them together, it was one of the biggest thrills of my life. With friends like Bill Clinton, President Obama hardly needs enemies. “After brief remarks by Obama, Clinton slid behind the lectern as if he’d never left the building. For a time it looked like he might never leave, as he fielded questions from a White House press corps eager to keep him as long as it could. He stroked his chin. He folded his arms and looked pensive. He gesticulated expansively. He was part professor and full politician enjoying the spotlight.